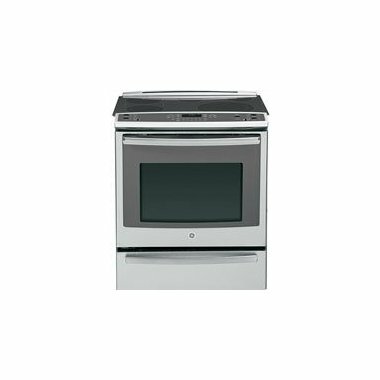 GE, PS920SF, Slide In, Profile, Ranges, Electric, GE PS920SF Features: True European Convection with Precise Air 6" / 9" / 12" 3600 Watt Power Boil Element 5.3 Cubic Foot Oven Capacity Warming Drawer with Vairable Temperature Control Self-Cleaning Roller Rack Glass Touch Controls, Digital Temperature Display, Electronic Oven Controls Fast Preheat Self-Clean with Steam Clean Option Interior Halogen Light Certified Sabbath Mode Cooktop Cleaning Cream and Sponge Included Sabbath Mode (Star-K® Certified) ADA Compliant UL Listed GE PS920SF Specifications: 5.3 Cubic Foot Convection Oven 6 Inch Warming Zone Element 6 Inch 1200 Watt Element 6-9-12 Inch 3600 Power Boil Element 8 Inch 2000 Watt Bridge Element 5-8 Inch 1900 Watt Bridge Element 8-Pass Broil Element Hidden Bake Element 2 Self-Cleaning Heavy Duty Oven Racks 1 Roller Rack 6 Rack Positions 5 Element "ON" and Hot Surface Indicator Lights Bake Wattage: 2, 850 Broiler Wattage: 3, 800 Convection Wattage: 2, 500 Amperage: 40 As a leader in the appliance industry since 1907, GE provides timeless and quality products that can fit in any kitchen. GE challenges the appliance industry with technology and engineering advancements, improving its customers' lives one appliance at a time. Accompanied with its signature delivery and installation experience, GE is a brand that is tried and true. 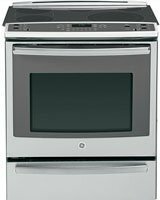 Store: Noble Appliance Center Condition: New (Open Box, or other) Price: $1499.00 Total Price: $1499.00 Buy It from Noble Appliance Center No returns. Coupon Details: Get $534.10 OFF automatically when you add this item to your cart! Regular price of $2063.10 will be shown prior to adding it to your cart.